Much of the balance was spent on fitting out the building. A large concert hall was supported by a billiard room, reading and writing areas, a dry (liquor-free) canteen and rooms for officers and NCOs. A separate bath house was built alongside. The building was lit by electricity generated on-site. 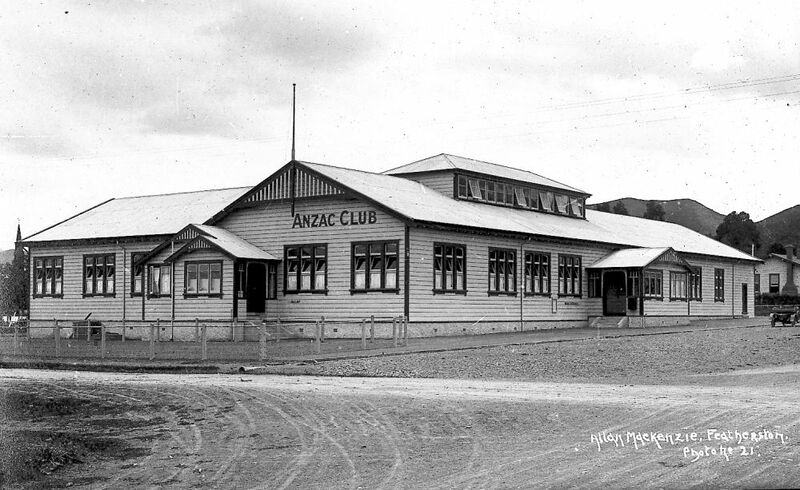 Anzac Club was to be ‘A place of resort, recreation and amusement for all those who are now or have been or may be during the term of the war employed in the military or naval service of the Crown’. The club had its own staff. The patron was Lieutenant-Colonel Noel Adams, commandant of Featherston Camp. Weekly dances and concerts were held, much of the music being provided by the camp bands. The club, along with the religious institutes and YMCA at the camp, offered a variety of recreation opportunities to soldiers on leave. During the influenza epidemic in November-December 1918 the Anzac Club served as a temporary hospital. Soon after, the war ended and the huge population of soldiers melted away. The House Committee (which owned and ran the club) resolved in 1919 to present the Anzac Club to the newly-formed Featherston Borough Council as a memorial to Wairarapa soldiers killed in the war. The original intention was, with surplus funds, to erect a war memorial next to the club but this was eventually built in the centre of Featherston. Anzac Hall functioned as a public venue, hosting balls, political meetings and concerts. It served again in World War Two as a temporary military hospital. One part of the complex, the Kiwi Hall, became a memorial to World War Two and was opened in its new form in 1950. In the 1980s the building was renovated and upgraded. It continues as Featherston’s ‘town hall’ today.